Before you head out to your next range day, don’t forget to stock up on ammo! Oh, and by the way, if you live in California, there are a few laws regarding ammo purchases now, and more laws that go into effect in the coming months. Just some small infringements on your 2nd Amendment rights is all. Wait, is this not the California state flag? 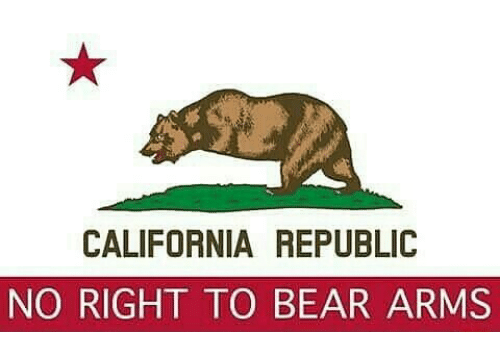 Because of Proposition 63, also known as “Gunmaggedon”, which passed back in 2016, those of us unfortunate enough to still be living in California are now subject to a brand new set of gun laws, including registration of self-assembled firearms (“ghost guns”), registration of the newly redefined “assault weapons”, and of course, ammo purchase regulations. 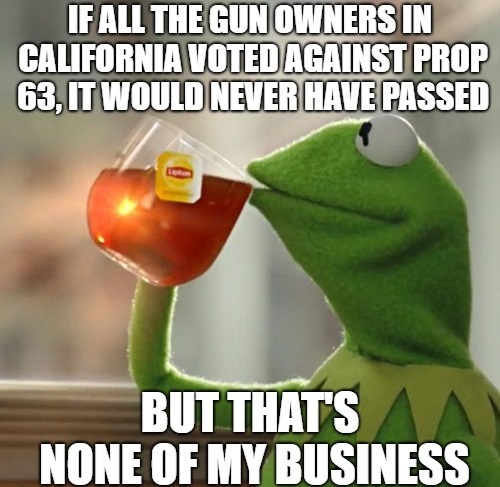 Since the voters decided to pass Prop 63, stocking up on ammo is no longer a simple process of logging on to your favorite online retailer, placing an order, and waiting for the box of ammo to show up at your door, all from the comfort of your home, wearing nothing but your underwear (that’s not just me, right?). There were essentially no restrictions on the purchase of ammunition before Prop 63, and it was treated like any other item you can purchase, online or in person. 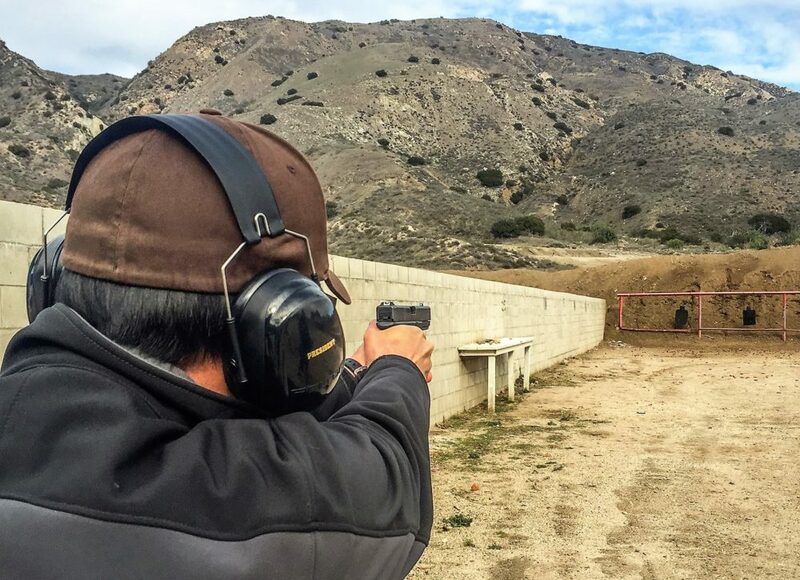 Of course, once Prop 63 did pass, the California Legislature was able to enact new laws to continue chipping away at our firearms-related freedoms. The biggest change in the law is that all ammunition purchases now have to be completed at an authorized ammunition vendor, or an FFL. If you just can’t break the habit of ordering ammo online, you’re still allowed to do that. The downside is you’ll have to have the ammo shipped to an authorized vendor or an FFL, to complete the ammo purchase. Completing the purchase basically means you can only take possession of the ammo through face-to-face interaction. And before you ask, the UPS guy handing you the box of ammo does NOT count. For those of you who normally just stop by your local gun store or Wally World on the way to the range, you’ll notice ammo is no longer available on the shelf. Instead, it will most likely be behind the counter, or locked in a cage. Access to the actual ammo is no longer permitted until the sales transaction. On the bright side, think of all the ammunition-purchasing related deaths that will be avoided! No more being crushed by 1000 round boxes of ammo! Thanks, California! Why Not Order Online Anyway? There are probably some ammo websites that will sell to you anyway, right? Wrong. In addition to being super illegal (like, super illegal), some of you may have noticed, you are no longer able to order ammo online at some websites, even if you wanted to. In the months leading up to 2019, when the ammo laws were about to go into effect, many online retailers stopped selling to California residents, regardless of whether the ammo would be sent to an FFL. For many of them, it just wasn’t worth the hassle. Of the retailers that do still sell to California, most of the savings you get from their lower ammo prices will probably be eaten up by the fees the FFL will charge to accept the ammo. Basically, you’re SOL. There’s Gotta Be a Loophole, Right? If you cannot stand the idea of having to buy ammo in person or paying retail prices, you can always become a licensed ammo vendor or FFL! Otherwise, you’ll have to be a police officer or some other type of peace officer to be exempt from the ammo regulations. 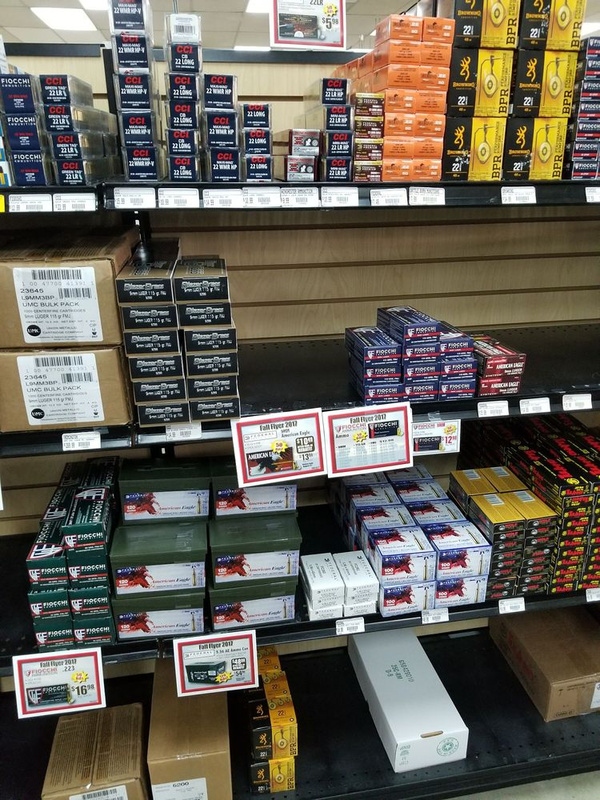 Essentially, unless you are willing to go through the process of getting an ammo vendor license or FFL, or becoming a police officer, you’ll have to go buy your ammo at a store and pay the marked up retail prices like the rest of us. On the bright side, if you decide to become a police officer and it’s anything like the Police Academy movies, you’re in for a wild ride! Okay, there might be a loophole. But to be clear, it isn’t a loophole. The law is designed this way. So really it’s just an exemption. Right now, if you possess an 03FFL and California Certificate of Eligibility you are allowed you to buy ammo online and have it shipped to your door as long as the vendor you’re buying from will do it. Since they (the seller) have to go through some extra steps Vs. a normal order, many vendors are just refusing to do so. And yes, as of this writing, this will work past July 1, 2019 when the new ammo restrictions come into effect. Once you get your 03FFL and CA CoE, you normally just have to email or fax a copy to the ammo vendor and they’ll link the documents with your account. After that, you can order ammo and check-out as normal! Just be sure to send in your documents before a major sale since the approval process normally takes a day or two depending on how busy the vendor is since a real human has to look over the paperwork and approve it. Who sells to 03FFL + CA CoE licensees? Thankfully, there are some great companies out there that are willing to go through the extra trouble to help out Californians with their ammo orders. And even better, our three favorites are on the list! There are other vendors that will ship to CA, but these are the ones that we use the most. For those of you waiting for the other shoe to drop, not to worry, there is more bad news! Starting in July 2019, in addition to the requirement of making ammo purchases in person, each time you buy ammo, you will have to go through an “eligibility check”. The “eligibility check” is essentially a mini-DROS (background check) that the ammo vendor or FFL has to do each time you buy ammo. The check will compare your information with the information on file when you registered to purchase a firearm, run your background, and confirm that you are not prohibited from purchasing ammo. If you are wondering whether you are prohibited from buying ammo, you probably are. Just to be sure though, you can always check our California Gun Laws article. If you fall into any of the categories that prohibit you from owning a firearm, you’ll be prohibited from buying ammo too. Because the check is like a mini-DROS, your information is checked against the California DOJ database. Usually, the check should only take a minute or two, but you might occasionally hit the jackpot and get the added bonus of waiting up to 10 days for the check to finish. 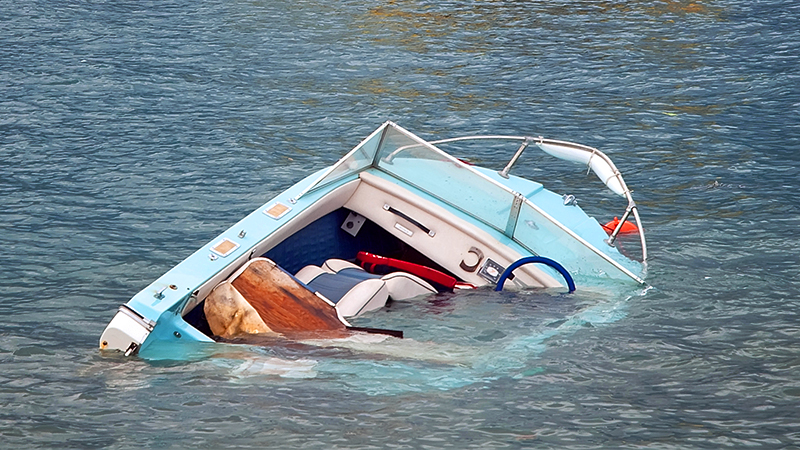 Since the “eligibility check” confirms your information with the information on your firearms registrations, those of you who do not have any firearms registered with the State, or lost all your firearms in a “boating accident”, will have to go through a special one-time eligibility check. This type of check will cost a little more, and will definitely take up to 10 days to clear. 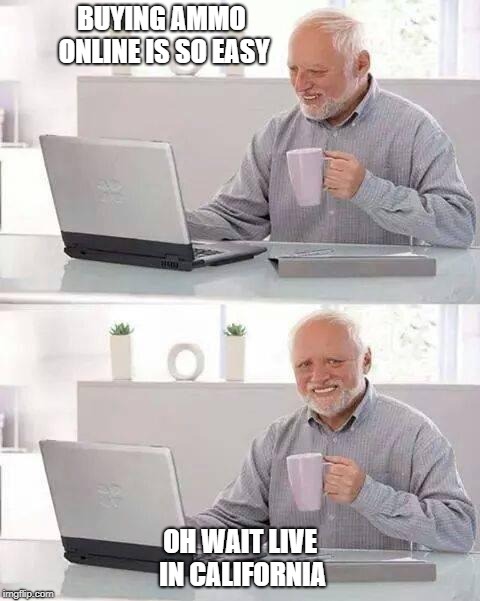 Look on the bright side though! You only need to go through the “eligibility check” for each transaction, not for each box of ammo. If you buy in bulk, you can save on the number of checks you have to go through. While there is technically no “ammunition registration” list being kept by the State, every time you purchase ammo starting in July, you will have to go through the “eligibility check”. The check itself is a list of people buying ammo, so everyone who purchases ammo as of July will be on that list. If it makes you feel any better, all firearms purchased in California (and even those transported from out of state) are already registered with the State, so this is just an additional list that firearms owners will be put on. In for a penny, in for a pound. Why are you still here? Go out and buy a buttload of ammo while you can! Even though you can no longer have ammo delivered to your door, you can at least avoid the “eligibility check” hassle for the time being. And besides, who knows how long it’ll be before the California Legislature comes up with even more firearms regulations!